TL;DR: Dating today isn’t like it was in your mother’s time, and that’s why “Not Your Mother’s Rules: The New Secrets for Dating” is the ideal book for single millennial women everywhere. With Ellen Fein and Sherrie Schneider’s expert tips, you can easily navigate this technology-filled world and land the man of your dreams. As a follow-up to their 1995 best-seller and “dating bible,” “The Rules: Time-Tested Secrets for Capturing the Heart of Mr. Right,” Ellen Fein and Sherrie Schneider have compiled an updated list of rules just for millennial women so they can fully understand the detrimental dating mistakes they’re making. “Not Your Mother’s Rules” consists of 31 guidelines that show women how to stop treating their love lives like their work lives, with more of a focus on mystery and less on being aggressive. Dating coaches Schneider and Fein said most women learn from their mothers how to study hard, get into a good college and start a successful career, but what they don’t learn is how to date, find the right guy and start a fulfilling relationship. Don’t talk to or text a guy first. Don’t just hang out or see a guy 24/7. Stop dating a guy who cancels more than once. Schneider and Fein created these rules based on their own life experiences and the mistakes of their clients. The co-authors want to show women they don’t need to treat landing a boyfriend like landing a position at a Fortune 500 company. So what’s causing millennial women to break the rules? Technology. According to Schneider and Fein, social media sites like Facebook and dating apps like Tinder make it easier for women to connect with men, but they also make it easier for women to do the wrong things. Fein added the rules are very easy to work into everyday life, making them something that will help women see results fast. “When you’re doing the rules, it just comes naturally,” she said. Why do the rules work? The proof is in the pudding – Fein and Schneider are both happily married because they followed the rules in their own dating lives. Both women took it slow and made their now-husbands make all of the moves. “They had to chase us, and that made them appreciate us,” Schneider said. Their success in love also shows playing hard to get has not gone out of style. 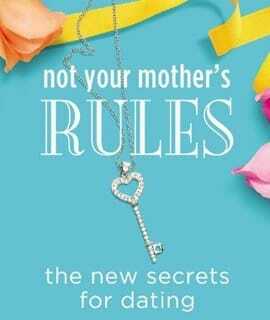 “Not Your Mother’s Rules” isn’t for those who can’t handle the truth. Unlike other dating books that sugar-coat everything, Fein and Schneider aren’t afraid to tell it like it is and call women out on their mistakes, especially when it comes to chasing after men and being too available. Fein said while there are some critics of the book, most women need tough love like this in order to make the changes needed to improve their love lives.